Indoor water parks around the UK make summer-style family fun a real possibility throughout the year. The best UK water parks are great rainy day havens during cooler weather. After all, if you're going to get wet, you might as well get really wet. Peaceful indoor heated pools at hotels and health clubs may be lovely for adults, but kids want the more uninhibited action and excitement of splashing around in moving water. Let's face it, most of us do. If you are taking advantage of low season rates for a more economical family vacation, adding a water park visit could make the reluctant adolescents in your party a bit more enthusiastic. Try one of these top indoor water parks. Part of the Bluestone National Park Resort in the Pembrokeshire Coast National Park, The Blue Lagoon has giant slides, a wave pool, water cannon and all the usual water park attractions, plus occasional After Dark parties with music and live entertainment, underwater aquacycling and Wild Water Fridays, when wave machines, water cannons flumes and other features are all turned up full blast. What makes it special? Besides proximity to the beautiful heritage coast of Pembrokeshire in Wales, a vacation at the Blue Lagoon is one of the greenest holidays in the UK. All the water it uses is heated by a biomass fuel driven system. It's believed to be the only facility of its kind anywhere in the world to be heated in this way and is also the biggest biomass system in Wales. The computer-controlled, remotely-monitored onsite energy center is hidden under a turf roof. It uses wood chips made from "top,lop and brash" from local, naturally felled woodland, as well as Miscanthus, a sterile hybrid of several African grasses grown by local farmers on land that might otherwise be unused. Sessions Adult, child and family tickets are available and booking online is highly recommended. Each ticket is for a three-hour session, including changing times. If you book online and collect your tickets when you arrive, you save 15%.Guests who stay at the resort can use the Blue Lagoon freely as part of their holiday. Before Disney came to Paris, a trip to Alton Towers in Staffordshire, not far from Stoke-on-Trent, was the biggest treat most kids in the UK could imagine. It's still one of the UK's top family attractions, with several hotels near imaginative thrill rides and themed experiences. The Alton Tower Waterpark, formerly known as Cariba Creek, is an indoor, "tropical" lagoon with water slides, water cannons and a steaming volcanic hot spring. Splash Landings Hotel, designed to give guests a "Caribbean experience," adjoins the water park. Admission is separately priced though packages that bundle family hotel stays with water park and theme park admissions are available. The Water Park is open year round but the Theme Park is only open from March to early November. What makes it special? Master Blaster is a water coaster that surprises with sudden blasts of water. Adventurous visitors can try the hot Bubbly Wubbly Pool, outdoors amid clouds of rising steam, or opt for the quieter, indoor Volcano Springs. There's an interactive "Waterworks Treehouse with 70 different things to do, and every now and then a bell rings before the "Tipping Bucket" releases a deluge of 1,000 gallons of water. Sessions Tickets for day sessions are sold up to a month in advance with a 25% discount for tickets purchased online. There are adult, child, senior and disabled tickets as well as four different kinds of family tickets - so its a good idea to check current prices online. Stoke-on-Trent is becoming something of an indoor waterpark center with Waterworld giving Alton Towers' Waterpark a competitive run for its money. At least 400,000 visitors a year head for this indoor waterpark for their splashy attractions. They claim to be the UK's No. 1 tropical indoor waterpark. Rides include slides, a challenging lily pad walk for older children and the Nucleus, a water roller coaster. Be warned, this is a screamingly active place with no quiet corners for adults to lounge poolside. What makes it special? Friday nights are Wave Rave, an aqua disco aimed at teens and tweenies for an after school treat. The latest chart toppers, a DJ and dancing with lights and smoke on a new dancefloor and in the water. Sessions Individual tickets, family tickets and spectator tickets are available with a discount for tickets purchased online. Online ticket holders can also jump the queue (in other words, no waiting in line). 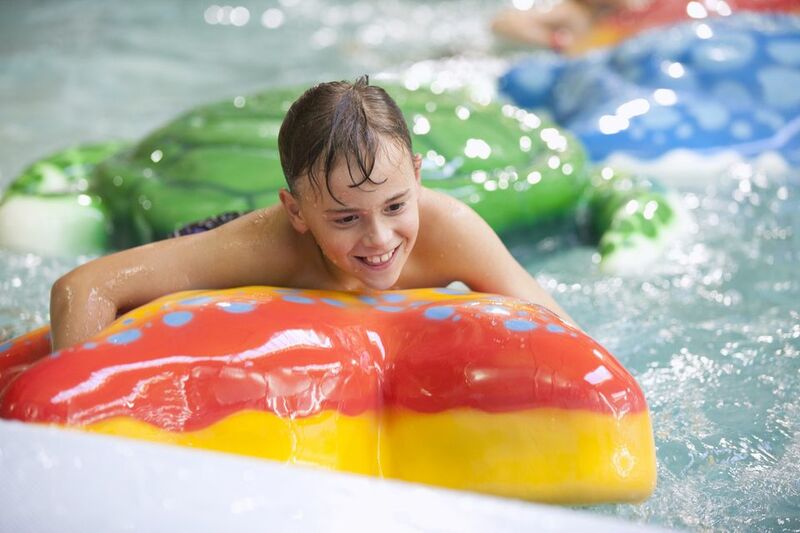 This community leisure center in Berkshire has had a recent refit and can now boast a range of exciting waterslides and quieter activites for adults and families with toddlers. Located in the Home Counties area, it is easy to reach if you are visiting London and the Southeast. It operates as a membership leisure center but also has bookable day sessions, swimming lessons and the like. What makes it special? There are five brand new waterslides that vary from really daredevil experiences - fancy being shot out of a water cannon? - to gentler slides for young children. The Cannon records you time at the end of the ride so you can launch yourself at whatever speed your dare. The indoor pool has a pirate ship and occasional water cannons to duck under. Sessions Two hour sessions for Family Fun with Flumes are bookable online. The two hour period includes time spend in changing rooms. Hours vary during school term time, weekends and vacations so check the website. Spectator tickets are also available so Grannies can watch the fun.